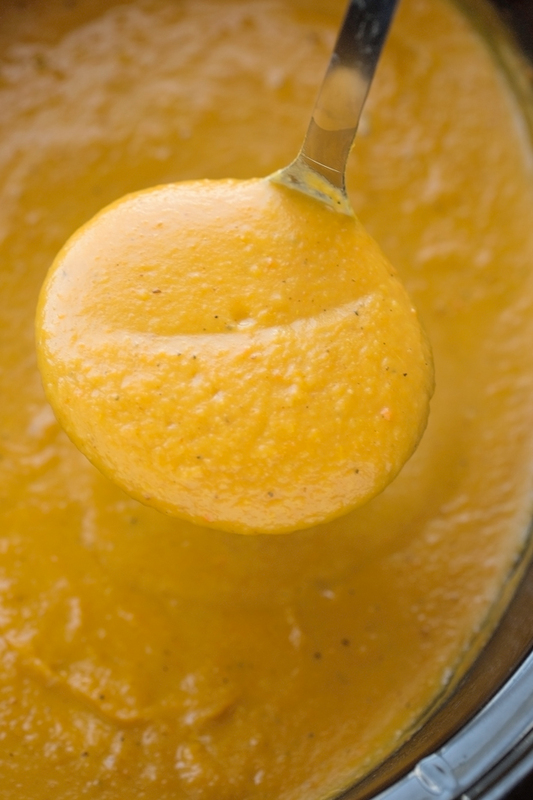 Smooth, creamy, and super comforting curried Butternut Squash Soup made in the slow cooker. Granny smith apples, onions, and carrots give this soup such a nice well rounded flavor. A hint of cream makes it so comforting and luxurious! Well hey there chilly Monday morning! It’s been a while! Guess what’s for dinner tonight? 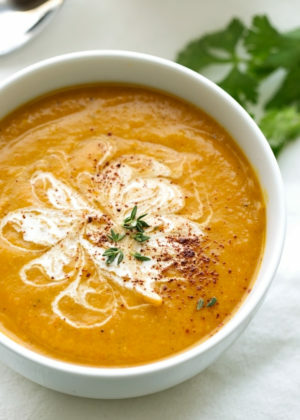 A warm, comforting butternut squash soup thats made with REAL food and lotso flavorful goodness. As in a bowl full of coziness. It’s like fuzzy socks for your soul. Okay, kinda weird. Just roll with the punches. And it also just so happens to be perfectly meatless for meatless Monday. This wittle magic butternut squash soup came about a couple of years ago. Only, it took me hours to make it because I would roast the veggies (butternut squash, onions, carrots, and apples) in the oven for hours prior to cooking it on the stove, then blending it all up and adding a little sinful cream to it. It’s come a long way since then. Now it all gets piled into the slow cooker and all you need is a quick emersion blender action to get it all creamy and smooth. Wait, what? Oh the flavor? My friends, that’s the best part. I can without a doubt say that it actually tastes BETTER than its oven roasted brother. Think of all of those veggies. How well are they going to pair with each other? Flavors? They’re going to pop and just smooth out with that bit of cream. We’re talking EVERYTHING that makes a curry taste so amazing. A couple bay leaves, ginger and garlic, and my super super favorite ingredient for this soup — cinnamon. And with the near ZERO prep time if you just buy precut butternut squash pieces, it’s going to be one super delicious breeze. And those of you that will actually cut your own butternut squash for this soup, i’m telling you. This is the ONLY SOUP that’s WORTH IT. Every last little bit of that elbow grease. Speaking of, i’m not allowed to chop butternut squash at home anymore. I’ve damaged/endangered every finger on each hand now. Bless you Costco for selling me chopped butternut squash chunks in bulk! My husband, family, and doctors thank you! 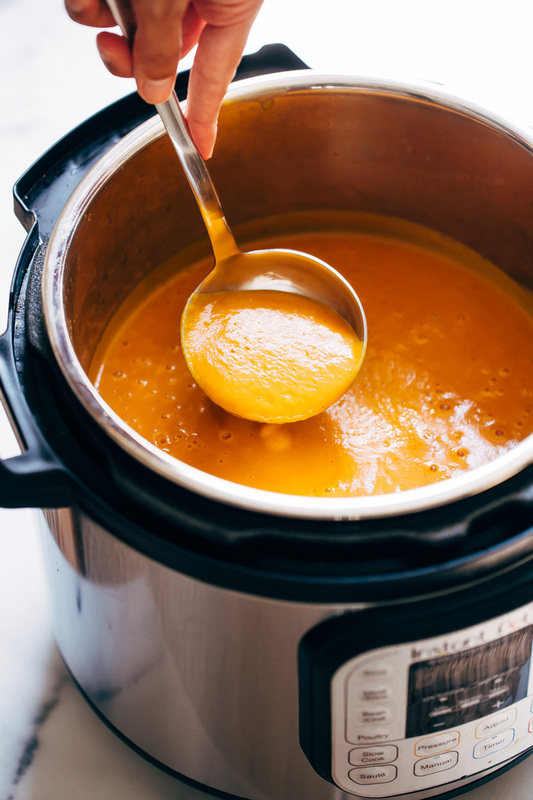 Plus slow cooker butternut squash soup will only taste better with time. So Sunday nights dinner will make for even better Tuesday and Thursday lunches. A handful of saltine crackers. And even though my inner veggie loving goddess disapproves, a little turkey sandwich with cranberry sauce action would be a game changer with this soup. There I go again! Getting ahead of myself with all that cranberry talk. It’s super friendly comfort food, guys. 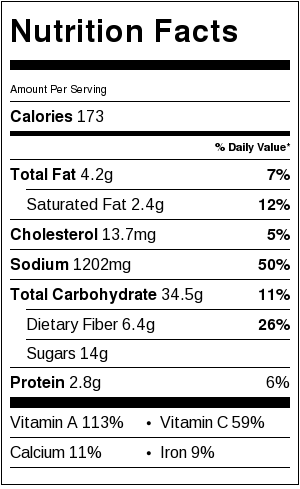 And while we’re on the subject of guys, my guy reported that he reeeeeally liked this butternut soup. Um. The meatlover just confessed to liking something completely vegetarian without me giving him the ‘veggies are important lecture’. Those of you that totally get me about super flavorful soups that are completely vegetarian friendly and loaded with flavor, thank you! I know you’re out there! 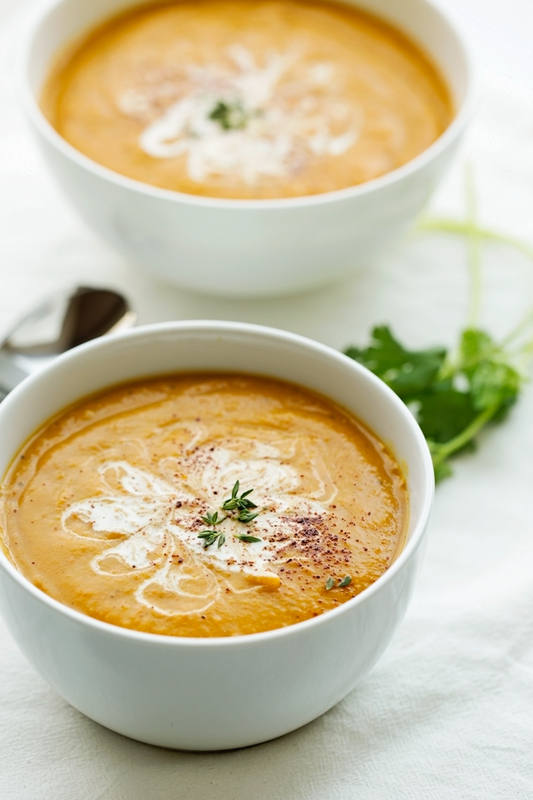 You’re going to love this super creamy and comforting butternut squash soup. Um.. and hopefully your significant other will too. 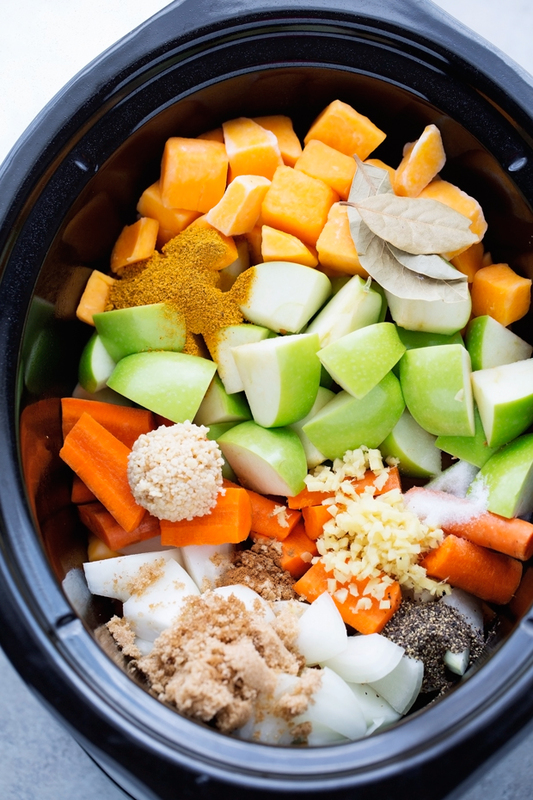 slow cooker: Spray a 7-8 quart slow cooker with nonstick cooking spray. 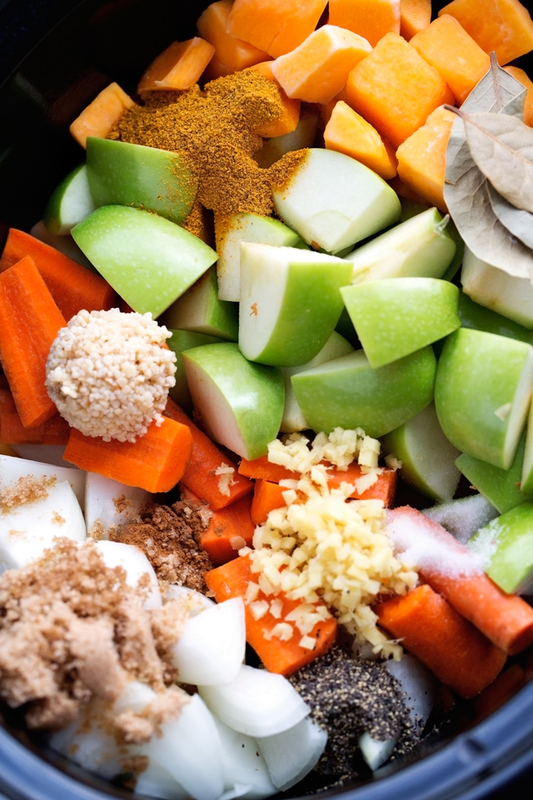 Add the butternut squash, onions, apples, carrots, sugar, salt, black pepper, bay leaves, curry powder, cinnamon, ginger, garlic, and vegetable broth. Allow the soup to cook on the low heat setting for 7-8 hours or on the high heat setting for 4-5 hours. instant pot: add everything but the heavy cream and cook on manual (high pressure) for 30 minutes. Let it hang out for 10 minutes before venting and releasing the pressure. both: The butternut squash is done when you can easily pierce it with a fork. Using an emersion blender, or by pouring the soup in batches into a conventional blender, blend the soup. Make sure to hold the lid down with a towel if using a regular blender. Stir in the cream and adjust the curry powder, broth, salt, and pepper to your liking. 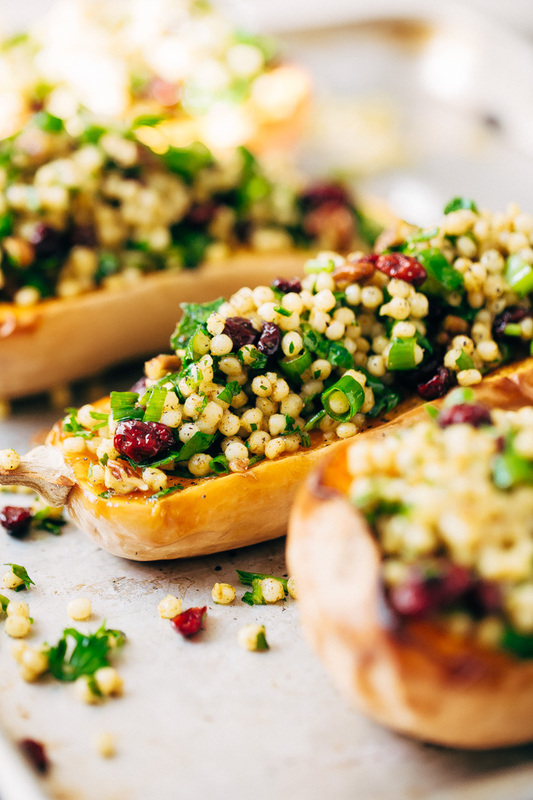 Serve warm with garlic toast or saltine crackers.